My magnet system helps me keep track of who’s bred and who’s for sale, which cages are clean and which need to be cleaned, and how much to feed each rabbit (or group of rabbits, in the case of the youngsters). The magnet system is flexible. Yours could tell you who’s on medication or who is going to the next show. The best thing about it is that it is easy. If you walk down the aisles of my barn, you will see a tag on each cage telling whether the rabbit receives 1/2 cup, 3/4 cup, 1 cup, or free feed. Most of my rabbits receive 3/4 cup of pellets per day (which is 3 oz. by weight for the extruded feed I use), but those with smaller appetites may receive 1/2 cup and a few with huge appetites (who are not overweight) receive 1 cup of feed. Mothers with litters, and litters that are still together without their mothers are fed freely, “free feed.” (Please note that when I was using regular, non-extruded feed, those amounts were 1/3, 1/2, and 2/3 cups). Back when I use to have empty cages, they had either a “Cage Ready” or a “Need to Clean” tag on them. I thought about making the tag say “Clean Cage” but then I would be confused about whether I should clean the cages or whether the cages were already clean! Usually it’s easy to tell a clean cage from a dirty one, but sometimes a cage is used for a short period of time (or a longer time by one of those very neat rabbits) and may look clean, but still need to be cleaned before another rabbit uses the cage. Plus, when I see four or more “Need to Clean” tags, it’s time to get out the buckets and brushes. Otherwise, the task could get overwhelming. 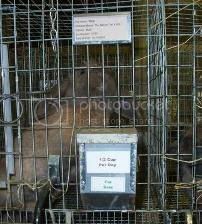 Some cages have “For Sale” signs on them. My barn is not designed to contain visitors very well, and often pet customers are roaming the aisles before I know it, picking out my show bunnies for their future pets. The “For Sale” signs help them to keep their expectations more reasonable (don’t bother falling in love with the ones without the “For Sale” signs). It also helps me as I deliberate over who I am willing to part with. I have often removed and replaced the “For Sale” sign several times before finally deciding to sell or keep a rabbit. You will also see little green “Bred” tags on some cages, along with numbers indicating the month and day the doe is due. On breeding days, you feel sure that you won’t forget who’s bred and who’s not. You diligently write the due dates on calendars and enter the information into your rabbit management software, but then promptly forget. Who hasn’t heard stories of breeders totally forgetting that a rabbit was bred, only to come home to a litter of bunnies born on the wire (or maybe you’ve even done it yourself)? I like having a daily reminder as I walk down the aisles, feeding and observing my rabbits. If nothing else, it’s a reminder to check the calendar! Print out my feeder tags or create your own. Each rabbit who is a long-term resident of my barn has a magnetic label containing identifying information. Short-term rabbits (babies I’m growing out that I’m still deciding on, for example) get the same kind of tag, but it’s just paper. For short-timers, I print the tag on card stock. It makes a pretty nice tag, but cage vibrations tend to make the cardstock ones slip out a bit–just enough for the rabbits to nibble the ends and sometimes pull the whole thing out. The magnetic labels resist the vibrations and stay whole and readable for a much longer period of time, but are more expensive. I have two formats for the cage identification tag. For rabbits born to other breeders, I list the pet name on the first line, the pedigree name on the next line, the gender, the ear number (really nice when you have help putting rabbits away after a show) and the birth date. For rabbits born in my barn, the only difference is that, instead of the pedigree name, I list the parents of the rabbit so I can keep track of genetic relationships more easily. You may be asking yourself, “Where can you put a magnet on a rabbit cage?” (Well, probably not, since you’ve been looking at the pictures.) There are at least two answers, and maybe more. I use the “through-the-wire” type feeders with a metal lid. Magnets attach very easily to both the back of the feeder and the lid (though the lid will get dirty much, much faster). The other item I use is a business card-size metal holder that attaches to the wire of the cage. They cost less than $1 each and attach in seconds. You can order them from rabbit supply companies (I got mine from KW Cages). I place two of these on cages with roommates and those for mothers with litters. Bachelors and youngsters have at least one card holder on theirs (sometimes there’s a blank one from when a litter used the cage previously–I just leave it because I’ll probably use it again later). The rabbit’s identifying information goes in the top holder and the litter description or the roommate’s identifying information goes in the lower card holder (a litter description might read “LT’s Maximus x Mary’s Abby, February 1, 2011”). If the cage is empty, I put the “Need to Clean” or “Cage Ready” magnet on the card holder. The feed instructions are placed on the back of the feeder. Generally, the instructions stay the same for a rabbit. But sometimes a rabbit on 1/2 cup feed leaves some food every day. If so, I lower the pellet amount to 1/3 cup. I raise it for rabbits who are always starving on 1/2 cup, but who do not become overweight on 2/3 cup. When mothers kindle, I raise their feed status to “Continuous Feed” when the kits are about 3 or 4 days old. I free feed the rabbits in that cage until the babies are separated into individual cages (the mother is removed from the kits at 7 weeks and goes on 1/2 cup when she goes to her new cage). To make the magnets, purchase magnetic sheets for your ink jet printer (find them where printer paper is sold). On a word processing program, create some boxes and type the words that would be useful to you in the centers. You can use the ones I’ve created (these are .doc documents for Microsoft Word) or make your own. The feeder tags include the “For Sale,” “Cage Ready,” “Need to Clean,” and “Bred” tags. Once you’ve printed them, cut them out and you are done. To create your own system, think about how you use your barn and what you most need to keep track of. For me, I need a clear feeding plan so that my substitute rabbit managers (that would be my mom and sister, who help me out when I’m traveling to shows and such) to feel comfortable and confident in feeding my rabbits in my absence. Also, I am also very picky about having clean cages when a rabbit changes homes, thus the cage cleaning tags. I am very visual in planning for my rabbits, so it helps me to see who’s bred, who’s got litters (I can see the box or babies and don’t need a tag for that, at least!) and who may be available to breed (I can check the birth date easily to see when a doe reaches 6 months) as I walk down the aisles of my barn, thinking about what needs to be done. Whatever it is that you want to keep track of in your own barn, I think you will find that the magnet system can help you out.